A prison escape (referred as a bust out, breakout, or prison break) is the act of an inmate leaving prison through unofficial or illegal ways. Normally, when this occurs, an effort is made on the part of authorities to recapture them and return them to their original detainers. Escaping from prison is also a criminal offense in some countries, such as the United States and Russia, and it is highly likely to result in time being added to the inmate's sentence, as well as the inmate being placed under increased security. Aggravating factors include whether violence was used. Many prisons use security features such as motion sensors, CCTV, barred windows, high walls, barbed wire (or razor wire in some countries) and electric fencing to prevent escapes. Numerous methods have been used to escape prison over time. Many escapes have been successfully conducted by inmates who have invented their own methods. Weaknesses that are found as prisoners escape are often corrected at numerous prisons around the world to prevent future escapes in a similar manner. This leads inmates to finding new ways. Since prisoners usually have a lot of time in which they are doing nothing, this gives them plenty of time to think, allowing them to devise plans and figure out ways to escape. The following are methods that have commonly been used by prisoners in escapes. In some instances, a combination of these are used. While some prisoners are allowed out of their cells at times, others remain locked in their cells most of the time, particularly those in solitary confinement. Many prisoners who are kept in their cells must find ways out of the cells. Even those who are allowed out of their cells at times still have plans that involve escape from their cells. Cell escapes occur through either the door, the window, the light, the ventilation system, by breaking down the walls, or by tunneling underground. Some prisoners have escaped by picking the locks on their cells, creating keys to their cells, sawing bars off of the doors or windows, carving away the walls, or breaking away the vent. Breaking down or slipping through the physical containment of the prison, including that of the cell itself or the surrounding complex. Methods include destruction of the cell or compound walls, squeezing through tight spaces, or entering off-limits areas. Prisoners often destroy their containment with homemade tools, smuggled objects, or other contraband. Most prisons are contained on the outside by one or more fences, often topped with barbed wire or razor wire. Escapees manage to scale these fences successfully or cut holes in the fences, damaging them. These fences are also watched by one or more guards from a tower, but escapees manage to pass the fence when the guard is turned away, unable to see in the dark, or sleeping on the job. Outside the fences is often a perimeter patrol conducted by an officer in a vehicle, which stands as the final line of defense. Escapees manage to evade this by studying the length of time between passes or waiting until it is on the other side or using the cover of darkness. A rare method that has been used at times involves the digging of a tunnel under the facility that exits outside the facility. Attacking guards with blunt force, homemade weapons, smuggled weapons, or weapons stolen from overtaken guards. Some escapes involve one or more inmates taking over an entire unit or section of the prison, subduing guards, and stealing weapons or other objects they can use to their advantage. Deception may involve fooling one or more guards into believing the prisoner is authorized to depart prison grounds for a legitimate reason, or the prisoner disguising himself or herself as a worker or civilian who can exit prison grounds without arousing suspicion, or the creation of a ruse to mislead guards. In some escapes, inmates construct makeshift dummies to make guards believe they are in their cells, usually in bed, when they are not. This enables the inmate to gain a head start from the prison before guards discover they are actually missing. Such dummies are typically constructed quite crudely, often using the inmate's or another's hair, shoes, and miscellaneous materials for stuffing, hidden under a blanket to give the appearance a body is present. Finding holes in the security of the facility, and taking advantage of them. This may include the discovery of overlooked security issues, or taking advantage of guards who are not following policies or procedures, or are otherwise not doing their jobs properly. Taking advantage of intentional wrongdoing on part of prison staff. This may include the use of weapons or other contraband smuggled in by staff, or receiving assistance from staff who believe in that inmate's freedom and willingly assist. Some lower security inmates are permitted to leave prison grounds temporarily on the honor they will return. These include those who depart for employment outside the facility or furloughs that allow time outside for periods of time. Breaking while in custody outside facility grounds. Prisoners are often transported for work duties, to be moved between facilities, attend court hearings, for hospitalization and medical appointments, and other reasons. 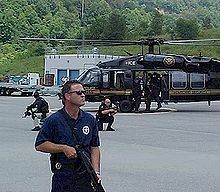 Receiving aid from an accomplice outside prison walls, including those who provide a ride to the inmate following their penetration, smuggle in contraband as visitors, use helicopters, among other methods. When a banned item is smuggled, it can either be slipped through or tossed over the fence from outside, hidden in a gift to the inmate that is legal, or slipped past corrupt security officers. In some cases, the staff are the source of the smuggling themselves. Escaping from an island prison brings another challenge of crossing the water to free land. This can be done by construction of a makeshift raft or receiving outside help from the owner of a boat. In the famed 1962 Alcatraz escape, a makeshift raft from raincoats was confirmed. One additional theory is that a boat was used to transport them in the water. In some jurisdictions, including the United States, escaping from jail or prison is a criminal offense. In Virginia, for instance, the punishment for escape depends on whether the offender escaped by using force or violence or setting fire to the jail, and the seriousness of the offense for which they were imprisoned. In China, Mexico, Belgium, Germany and Austria, the philosophy of the law holds that it is human nature to want to escape. In those countries, escapees who do not break any other laws are not charged for anything and no extra time is added to their sentence. However, in People's Republic of China and Mexico, officers are required to shoot and kill prisoners attempting to escape, and an escape is illegal if violence is used against prison personnel or property, or if prison inmates or officials aid the escape. ^ Beam, Christopher (April 25, 2011). "The Great Escapes". Slate. Archived from the original on 2013-09-28. Retrieved 2013-09-04. ^ "Vibrasector: Large Perimeter Security With Up To 1000m Protection". Detection Technologies. Retrieved 2019-03-13. ^ "§ 18.2-477. Prisoner escaping from jail; how punished" Archived 2009-01-17 at the Wayback Machine. Code of Virginia. Virginia General Assembly. Retrieved September 22, 2013. ^ "§ 18.2-479. Escape without force or vio to jail" Archived 2010-01-16 at the Wayback Machine. Code of Virginia. Virginia General Assembly. Retrieved September 22, 2013. ^ "§ 18.2-480. Escape, etc., by setting fire to jail" Archived 2010-01-16 at the Wayback Machine. Code of Virginia. Virginia General Assembly. Retrieved September 22, 2013. ^ Jordan, Mary; Sullivan, Kevin (15 Nov 2002). "Mexican Jailbirds Get to Fly for Free". The Washington Post. Archived from the original on 2018-08-07. Retrieved 7 Aug 2018. ^ Boyle, Robyn (10 Sep 2015). "No prison escapes so far this year in Belgium". thebulletin.be. The Bulletin. Archived from the original on 2018-08-07. Retrieved 7 Aug 2018. Prison escape in Belgium is not punishable by law, but escaped prisoners are punished if they commit criminal offenses in the course of trying to break out. ^ Zubrin Gold, Judith (Sep 1979). "Prison Escape and Defenses Based on Conditions: A Theory of Social Preference". California Law Review. 67 (5): 1183–1204. Archived from the original on 2018-08-07. Retrieved 7 Aug 2018. ^ "More on the Kaplan Caper"(subscription required) Archived 2009-01-15 at the Wayback Machine. Time Magazine. September 20, 1971. Dowswell, Paul (1994). Tales of Real Escape. London, England: Usborne Publishing Ltd. ISBN 0-7460-1669-7. McMillan, David (2007). Escape. Singapore: Monsoon Books. ISBN 978-981-05-7568-7.